In today’s installment of the Bronx Bomber Ball 2018 Pinstripe Previews, we will be looking at rookie infielder Tyler Wade. Wade was brought up last season after an injury landed Starlin Castro on the disabled list for a large portion of the summer. After a subpar first impression in the majors, Wade will go into spring training fighting for a spot in the Yankees' open infield. 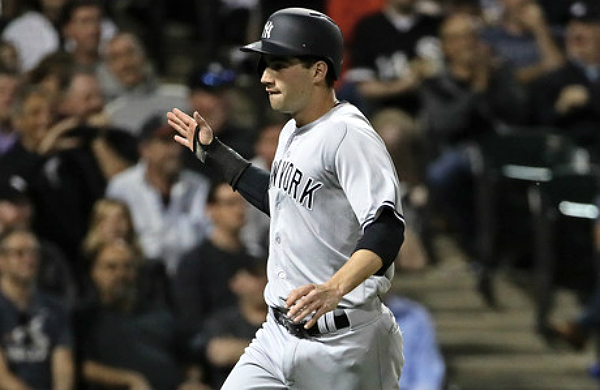 Wade was called up following an injury to the Yankees’ starting second baseman, and he appeared more than ready based on his Triple-A performance. Wade dominated Triple-A pitching in 2017 as he accumulated a slash line of .310/.382/.460 with 26 stolen bases and 33 extra-base-hits. However, he did not fare as well in the majors. His plate discipline was shaky, and he slashed only .155/.222/.224. He did showcase his speed and versatility, but left a sour taste in Yankees fans’ mouths with his poor offensive showing. The 23-year-old Wade will be given an opportunity to earn a spot on the opening day roster and potentially in the starting lineup. If the Yankees do not bring in another veteran infielder by spring training, Wade will join Miguel Andujar, Gleyber Torres, and Ronald Torreyes in a battle for the two remaining infield positions. Wade’s performance in spring training will be a crucial first impression on new manager Aaron Boone. If Wade does not make the team as a starter, there is strong possibility he plays a similar role as Ronald Torreyes did in 2017 and becomes the first guy in line if an injury occurs. Wade’s performance in the majors last season did not represent him as a player, and he should have a much more prominent role in 2018. The Yankees love his versatility and grit, and he brings a lot of speed to a relatively slow infield. The Yankees have always planned to groom him as a Ben Zobrist type utility-man and 2018 will be very telling for his future on this up and coming team.